You are confirmed to start Secondary School right away. Your detailed handouts are attached below. Before coming to your first class, please ensure that you have read all the information below. You have access to our online class reservation system where you can book the classes you would like to attend. You get 6 classes and 8 weeks to use them starting from your first class. If a class is full, simply add your attendance anyways and if someone cancels, you'll be bumped into that spot! Keep an eye on your email as you get closer to that date! We strongly recommend that our students book times in advance to avoid missing out and wait listing. If 24 hours prior to our class, we have low registration, we will cancel the class and ask registered students to rebook. 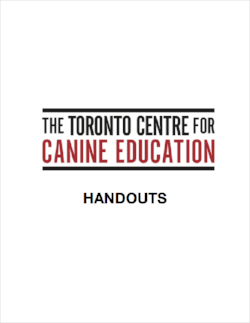 We do this to ensure that dogs receive the socialization opportunities they need during learning. There are 6 class themes and you have 12 weeks to complete all six themes. There is no particular order in which to complete your classes, however, we do not recommend starting with the Vet & Groomer theme if you are new to our school. CHOOSE YOUR OWN ADVENTURE - THIS IS A FLEX-CLASS - EACH STUDENT CAN CHOOSE A BEHAVIOUR FROM THE "MENU" AT THE BEGINNING OF CLASS AND YOUR INSTRUCTOR WILL WORK ON IT WITH YOU. Many people like to have the Choose your own Adventure class as their last class so that they can spruce up the skills they feel they need the most "sprucing". It's your adventure - you choose! If at any point your dog is unable to continue in classes, please let us know immediately upon diagnosis so that we can put your package on hold. Without immediate notification, your package will expire.